Collingridge’s award winning When It Snows has been released in paperback, and My Book Corner has fallen in love. 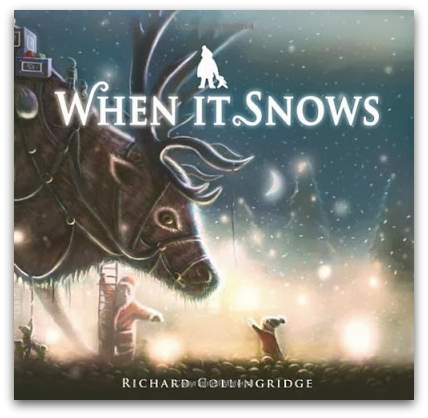 When It Snows is a beautiful, atmospheric picture book which is absolutely delightful for younger listeners. Evoking a magical, imaginative world Richard Collingridge’s creation is just perfect to snuggle up with at the end of the day. When It Snows captures the magic of those first days of snow – the stillness and the excitement. Brief and whimsical sentences on every page gently glide the reader through his walk. Past snowmen and fairies, forests and elves, all beautifully illustrated with soft glowing illustrations that almost tingle with warmth!! And then that ending … a simple comment celebrating the power of books and our imaginations. When It Snows is a book to savour and linger over as you soak up the delicious atmosphere Collingridge has so masterfully created.